Recently we looked at whether activity trackers were useful tools for athletes. While the Garmin Vivoactive HR is more of a smart watch than activity tracker, Garmin nonetheless includes the watch among its line of activity trackers. The Vivoactive HR has come along way from the simple trackers that flooded the market a few years ago and with a plethora of new and ever expanding features, makers of basic activity monitors are going to find their products quickly rendered obsolete. The Vivoactive HR outdoes its predecessor in functionality but with added features come added size and bulk. 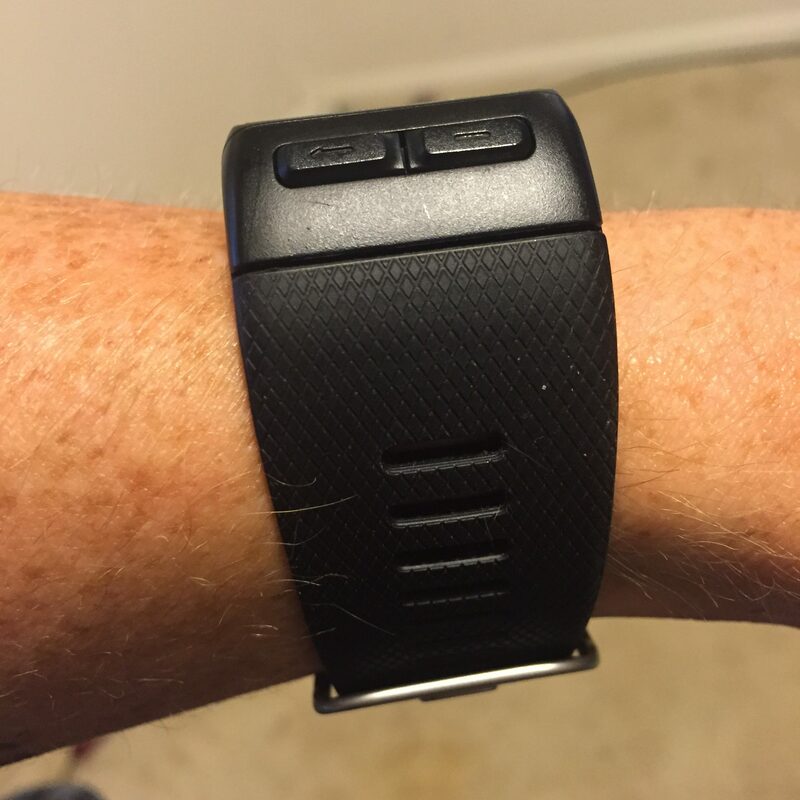 The inclusion of optical HR has made the unit taller and requires a more aggressive strap than the original Vivoactive. While the optical HR has its fault, after using the watch for several weeks, one wonders why we ever bothered with activity trackers that didn’t have HR. Step tracking is still a feature and the watch still buzzes at you to move every hour or so but with so many more useful features, step tracking is relegated to being merely an interesting if not entirely useless metric; something it should have been from the start. Heart rate and GPS capabilities make this watch the first ever activity tracker to really be useful for someone who wishes to change their habits and live a healthier life. Accumulating steps means one has to walk, which indeed is a healthy activity, but the feedback from HR monitoring finally provides trackers with the ability to relay information about how active a person really is and provides a longitudinal metric that can somewhat indicate the user’s level of fitness and health over a period of months and years. GPS allows user to track and upload their activities with greater detail and with better visual presentation. Rather than just steps taken, users can now track their HR, distance and route during everything from a basic walk, a bike ride, a hike, to a full marathon. While there are more powerful tools for tracking athletic performance, training and workouts, the Vivoactive HR stands as an all around workhorse for those who need minimal tracking for everything rather than excellent tracking for one sport. Cyclists likely won’t be trading in their Edge units for this but it does allow them to record bike rides where their cycling computer might be excessive or pointless (like a trip to the grocery store). More importantly it allows them to track the occasional run, swim, or hike. Runners might find that this is all they need. It lacks some functionality of a full fledged running GPS unit but with cadence tracking, distance, pace, HR, elevation, there isn’t much more a runner needs. Swimmers and triathletes will find the lap counter useful. It lacks the stroke analysis of a more robust unit but if pace and distance is all you need, and this is true for nearly everyone, then this watch is probably all you’ll need. GPS tracking for walks, runs, and bikes (pace and distance). HR tracking through the optical HR sensor for all but swimming activities. Also tracks HR throughout the day to establish activity levels and resting heart rate. Accelerometer for tracking pool laps, steps, run cadence. Altimeter for tracking elevation, total floors climbed throughout the day. Bluetooth connectivity for uploading workouts to Garmin Connect via smartphone, receiving smartphone alerts, controlling music, weather, calendars and more. The usefulness for athletes in terms of activity tracking is somewhat apparent. Just like any Edge or Forerunner, athletes can use this to track their workouts with metrics like heart rate, distance, and pace; all the basic metrics one needs to race and train. In addition to these obvious features the optical HR allows athletes to track their resting heart rate on a day-to-day basis. Resting HR can be used to estimate fatigue and general fitness. 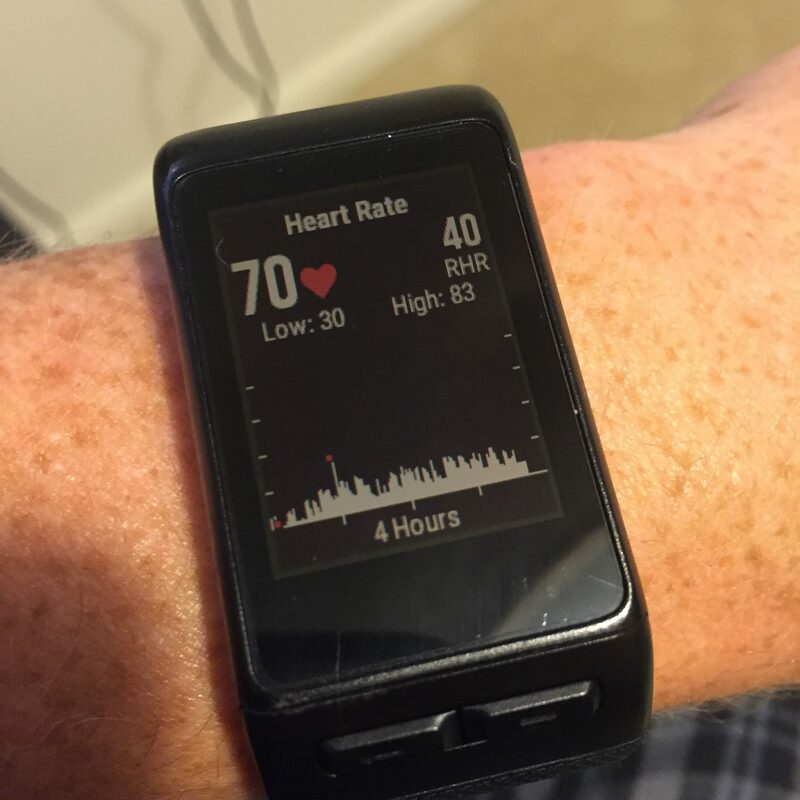 See our other article on Heart Rate for more information as to the usefulness of HR tracking. Because calorie consumption is more accurately tracked using HR, the watch allows athletes to estimate their daily caloric needs and fuel accordingly. Tracking HR throughout the day can also give athletes an indication of whether it was a restful day or an active day. While it might seem obvious whether we have been resting or active, sometimes we lose track of how much activity we are performing at work or at home doing chores. Any time our HR is elevated above resting we are expending energy. A hard or stressful day at work can cause HR to be elevated throughout the day, which can result in diminished training ability and feelings of fatigue. The watch graphs our activity in real time and we can see how we might have been affected by our daily lives. The most irritating part of this unit is the proprietary charging cable. Garmin is notorious for having a different type of charging dock for every device (with the exception of some Edge devices). Rather than incorporate a standard micro-usb, Garmin requires us to carry around yet another cable for charging the unit. Fortunately the strongest feature of the watch is the battery life. Used in tracking mode with continuous HR tracking the unit will last for nearly a week. Even when tracking activities and using the GPS functionality, the battery holds up surprisingly well. I tested the unit while camping for a week. I hiked for approximiately 6 hours per day and tracked each hike as an activity (which included tracking HR, GPS and elevation) and using the watch 24 hours/day in its regular capacity it still held up for more than four days. The construction of the unit isn’t very aesthetically pleasing and won’t win in you any compliments but it is waterproof and sturdy. It will take the abuse as well as any dedicated running watch or cycling computer. Because it is primarily touch screen I recommend a screen protector, which can be purchased online at a reasonable price. Speaking of the touch screen, it reacts much the same as the Edge cycling series. It is unaffected by water but is not as sensitive as a smartphone display. Fortunately the gestures and taps required to operate the unit do not require the same nuance as a smartphone. The GPS tracking is on par with any other of Garmin’s units or better. It leverages both GPS and Glonass and it connects quicker than most units to the satellites. The optical HR is only accurate during activity if the watch is worn tightly. It can be worn looser but still must be tight enough to stay in place for normal day-to-day HR tracking. Some people might have difficulties with HR accuracy. Skin colour, wrist thickness, hair density and vein proximity to skin can all affect accuracy. If you can see the faint blue marks of your veins through your skin, it will probably work fine. This isn’t to say that it won’t work if you can’t see your veins, but it’s almost certain that it will if you can. The unit boasts a relatively heavy price tag compared to the most basic activity trackers but with all the features it does have, it is far better to spend the money on this unit than spend even a little on something that tracks only steps and sleep. If your purchase decision is between this unit and a similarly priced Forerunner unit, I can’t see any reason why you would not choose this watch. Even if you don’t need the added functionality, this watch doesn’t lack anything a forerunner has that you would really benefit from. If your decision is between a cycling computer and this watch, the cycling computer is the better option. The mounting of the unit and the larger display of a dedicated cycling computer gives it the obvious advantage. The one situation where I would not use this watch is during a triathlon or bike race. It will not accurately track an open water swim and because the unit isn’t designed for quick access, you might find yourself wasting too much time in transition getting the activity started. In a bike race the only use this would have is as a heart rate monitor transmitting to your cycling computer. But because of the risk of crash, I would make an argument for leaving the unit in the car during a bike race. 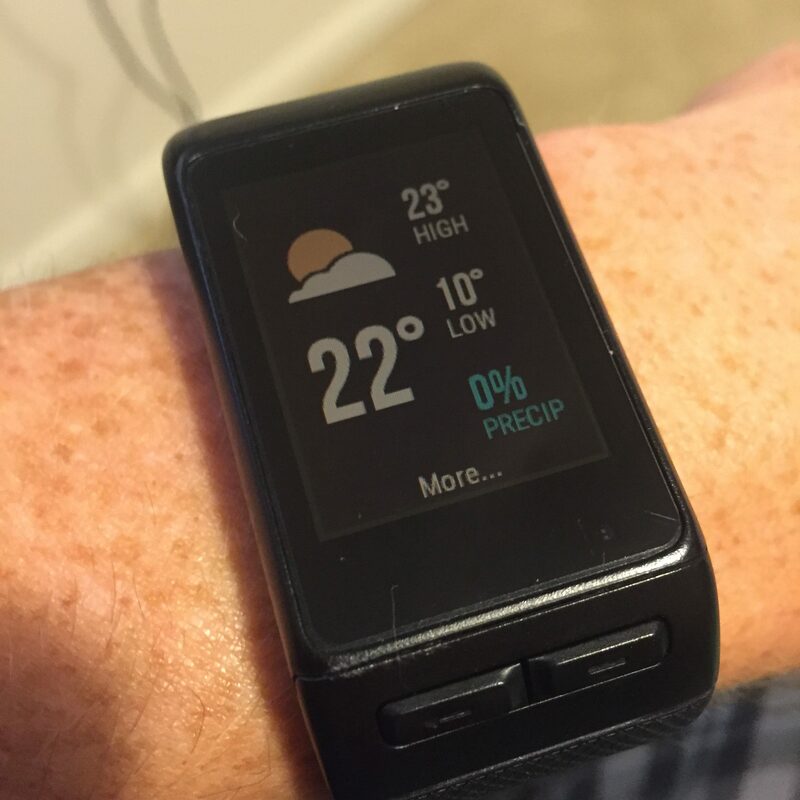 In summary, if you are a runner looking for a GPS running watch with HR functionality, get this. If you’re a triathlete looking for something that will track laps in the pool and runs but have a dedicated bike computer, get this. 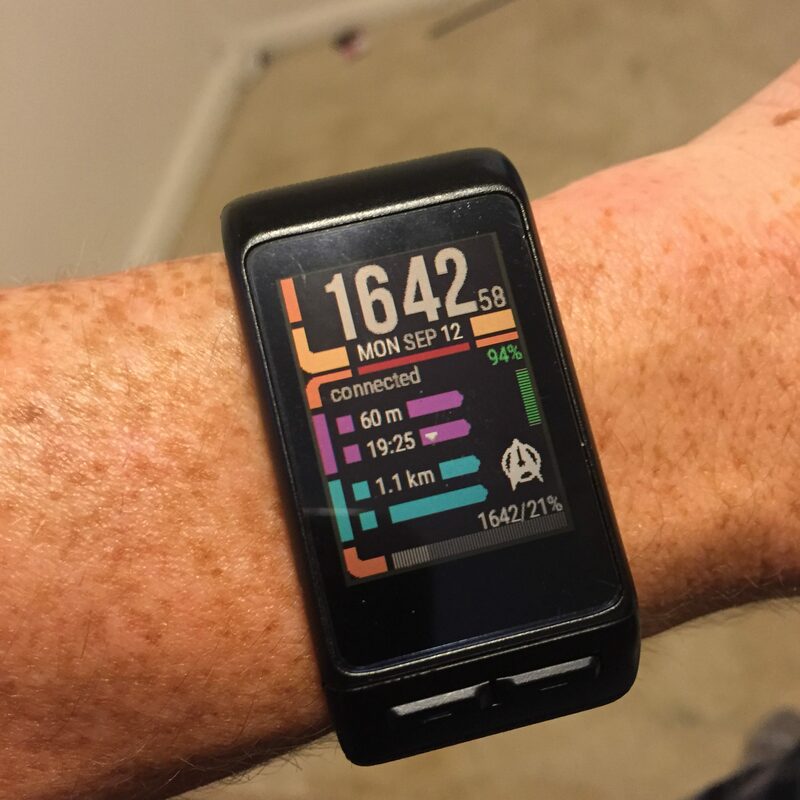 If you’re a cyclist with a dedicated bike computer but want something that will track the occasional run or swim and all around activity, get this. If you’re a casual fitness participant and want something that will motivate you to be more active but need a little more functionality (such as smartphone notifications, watch functionality, weather, etc) than just steps to make it worth wearing a device 24 hours/day, get this. Don’t get this if you’re uncomfortable wearing something snug on your wrist. Don’t get this if you care at all about being fashionable.